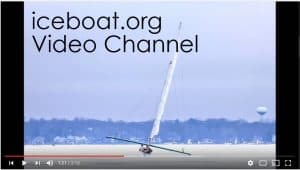 Another in the series on the connection between Detroit’s auto industry and iceboating. From the golden era of illustrations, an ad not from the car manufacturer, but from the company that supplied the body components for the Plymouth Duster, Budd. 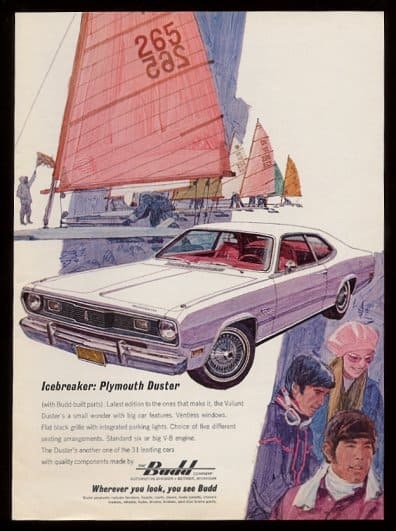 The iceboating theme fit right in with the idea of the Duster’s sporty body style. In DN trivia, sail number 265 was assigned to Barbara Frank of Pewaukee at the 1957 Northwest which was sailed on Lake Monona in Madison, WI. The sail number was transferred to William Perrigo in 1958. I suspect that the artist randomly chose the sail numbers.